– Bring a large pot of salted water to a boil. Cook noodles per package instructions, drain and rinse with warm water. 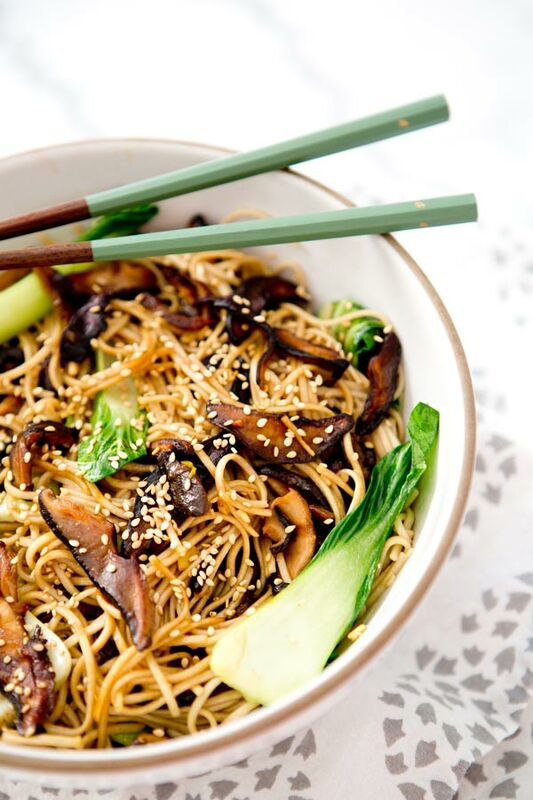 – While water is coming to a boil, prepare mushrooms, sauce and bok choy. – In a large non stick sauté pan heat earth balance butter with 4 tablespoons tamari and add mushrooms. Give a quick stir to coat and then cook on high heat for 6 minutes (do your best to not stir the after the initial mix). Give them another stir and cook an additional two minutes. The should be brown, slightly crispy and a little caramelized. Set aside until noodles are prepared. 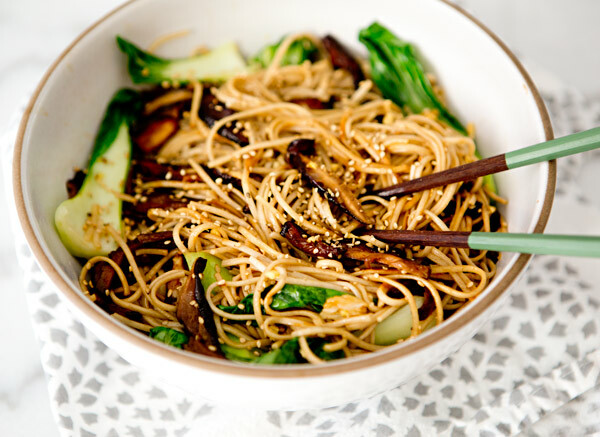 – For the sauce, combine mirin, garlic, ginger, sesame oil and 1 tablespoon of tamari. – For the bok choy, trim off ends, wash thoroughly and dry. 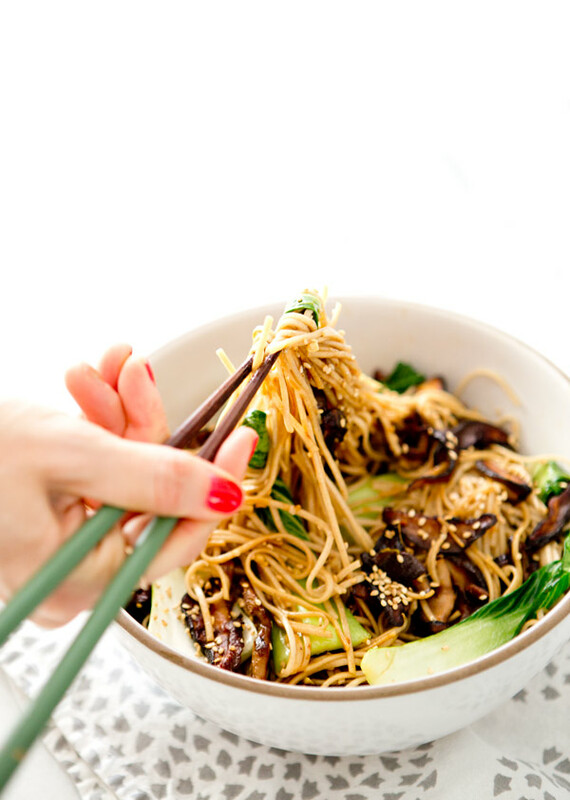 – In a large wok combine noodles, sauce, bok choy and mushrooms. Cook over medium high heat until bok choy is wilted. Garnish with sesame seeds and serve immediately! This looks absolutely amazing! 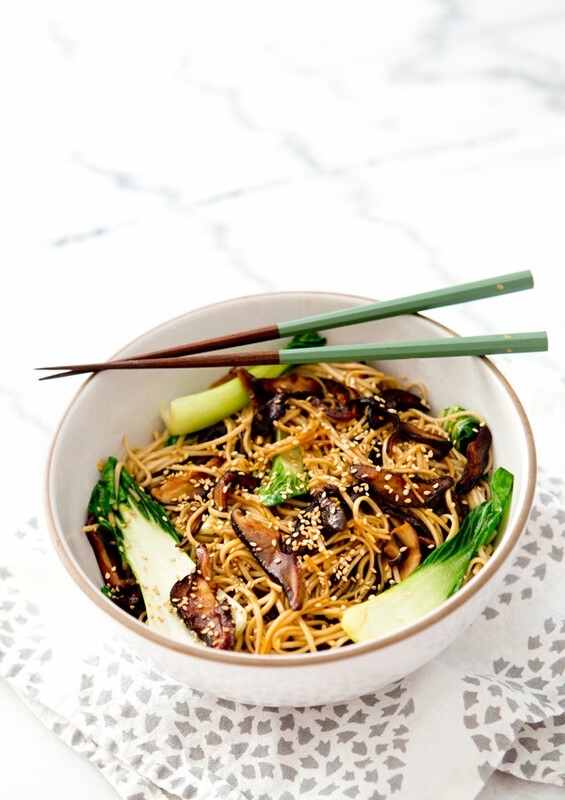 I just bought some shitake mushrooms at the farmers market and always have soba noodles on hand. I'll be making this tonight. I also have a wheat allergy. There are soba noodles available that are 100% buckwheat and don’t have wheat in them. Eden Foods is one brand I know that fits the bill. Though they are made on equipment that also handles wheat if cross contamination is a concern for you. oh my! this looks delightful! i may have to try it out, thank you so much for sharing! Do you use toasted sesame oil? Looks fantastic! oh my goodness. delicious! thanks for the idea! I am going to make this tonight! Did you use a 16oz box of soba noodles? or 8oz? You have to check ingredients. True soba noodles are made from all buckwheat. Most sold in grocery store are mix of wheat and buckwheat. Buckwheat is a gluten-free grain. Hope that helps! This was so delicious! Made it for dinner last night and both my husband and I LOVED it. My husband and I fixed this recipe last night!!!!! It was amazing. Thank you for the posting. As with all new recipes, I will make some amendments next time. I will saute thin shreds of Napa cabbage, thin sticks of carrots, ribbons of spinach, slivers of onions and small bites of broccoli to add to the bowl. That is the beauty of this recipe. You can add vegies to your hearts desire. The tamari mushrooms were very tasty however I prefer a less salty flavor and probably will halve the tamari.next time. I missed the subtle flavors of the shitake mushrooms on their own. Tofu, and other sources of protein could be successfully added. The sauce was wonderful! The mix of tamari and mirin was delightful. My husband and I will continue to make this recipe. We LOVED it! Thank you so much. I just tried this out and it was delish! I can't wait to try out some more of your recipes. Thanks for sharing! Insanely delicious. Added a few button mushrooms, thinly sliced mild onion and seitan. I used mungbean noodles and dehydrated shitake, both of which were on hand. Even my boyfriend, the world's pickiest (vegetable-hating) vegetarian, loved it. Thank you for this lovely recipe. My boyfriend exclaimed it was the best soba noodles he ever had in his life! 🙂 The tip for the mushroom really did the trick! Be 6 oz…. And well, u can guess how that turned out lol, I had to triple the sauce !!! Please fix it so no one else makes the same mistake. Other than that it was delicious! Thanks for the recipe!!! This has become an almost weekly staple in our house. I usually make it as written, but I started grating the ginger and garlic into the sauce and BAM – so good. I’ve also made it with tofu and squash when I happened to have everything else on-hand and also delicious. So adaptable, soooo good. Thank you, Sarah! will be able to see and compare shipping rates of different companies. i can’t seem to get any tamari where i live, i can’t even buy it online… will it turn out ok if i use soy sauce instead? My sister and I made this tonight and it was very yummy! Sadly, I couldn’t find any shiitake mushrooms at the market, so I just bought portobellos instead which were quite salty, but they did the job. I’m excited to make it again sometime soon with the right mushrooms because it will probably taste even better! Thank you! This was delicious!!! Don’t skip, skimp, or shorten the mushroom process, it adds great flavor. This is my new go to quick, easy and delicious dinner. Thanks. This sounds so good! I shared it in a blog here http://wedigfood.com/foodie-blog/better-thank-take-out-asian-inspired-vegan-recipes. I am building a community of vegans and would love for you to hop over and leave a recipe. Made this tonight and it was so easy and delicious. This will definitely go on my short list for weeknight dinners. Thank you for a fantastic recipe. Hello, just checking that the tamari quantities are correct? In the ingredients it asks for 1/4 cup + 3tbsn but only mentions 4tbsn in the method. I suggest stirfrying the mushrooms in the wok without the tamari, then it will be less salty. 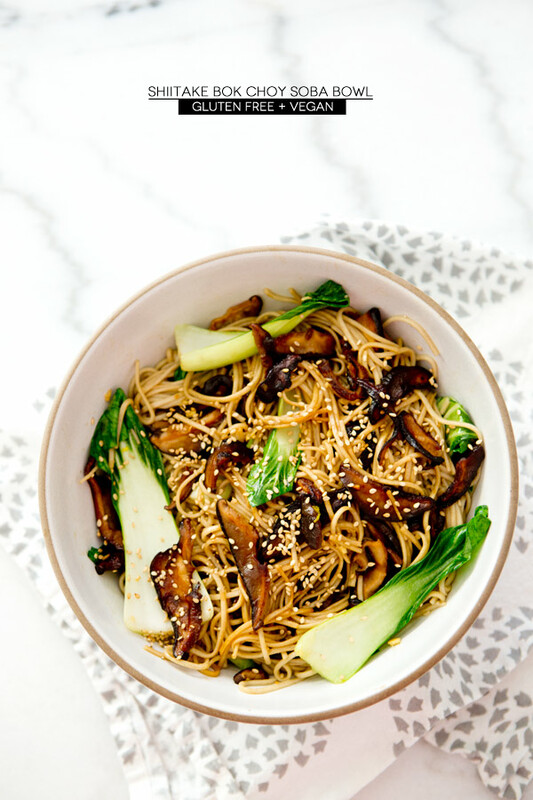 I also added the bok choy after the mushroom, so they get stir-fryed earlier, quick and hot. The sauce was good, I added some rice vinegar too. Thanks for the recipe. Delicious! A big hit with my husband and son! I followed the directions and didn’t have any trouble and I consider myself a beginner level cook. I did add pork sliced very thin from center cit pork chops and used a batch of the sauce as a marinade.